This is the coolest thing I’ve ever seen. Ok, maybe not THE coolest, but it is clever. Ok, maybe not clever… Actually, it’s probably kind of dumb. But who knew Duct Tape could be so useful? Most people agree that Duct Tape can save you money on costly repair bills but did you know that you could create a wallet to hold all of the money you’ve saved? It’s not as difficult as it sounds and in just a few simple steps, you could be the proud owner of this year’s most important fashion statement (Duct Tape is my life). Full step-by-step instructions for your very own Duct Tape wallet are available directly from 3M. The MythBusters have since done an episode on all things Duct Tape where they built a sailboat out of Duct Tape. Unfortunately, they did not get the plans from me. 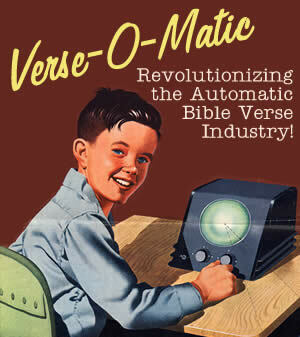 The new Verse-O-Matic plugin is here. This handy WordPress plugin displays a random verse and has an optional “translation bar” to link to additional translations. Click here for more information or to download the plugin. I am testing a new version of the Verse-O-Matic plugin that will get it a little closer to my original idea. I have allowed for the text file storing the verses to be multi-dimensional in that it can store the version, the scripture reference, the verse text, and an associated link in a delimited format. The new Verse-O-Matic then randomizes the set, picks one, and displays appropriately. I will be testing generic cialis this a little more and release Verse-O-Matic 2.0 beta in a day or two. Until then, feel free to continue to use the current version as the upgrade will only require modifications to the verse-o-matic-list.txt file. The new alpha version is currently being used in the sidebar of this site.